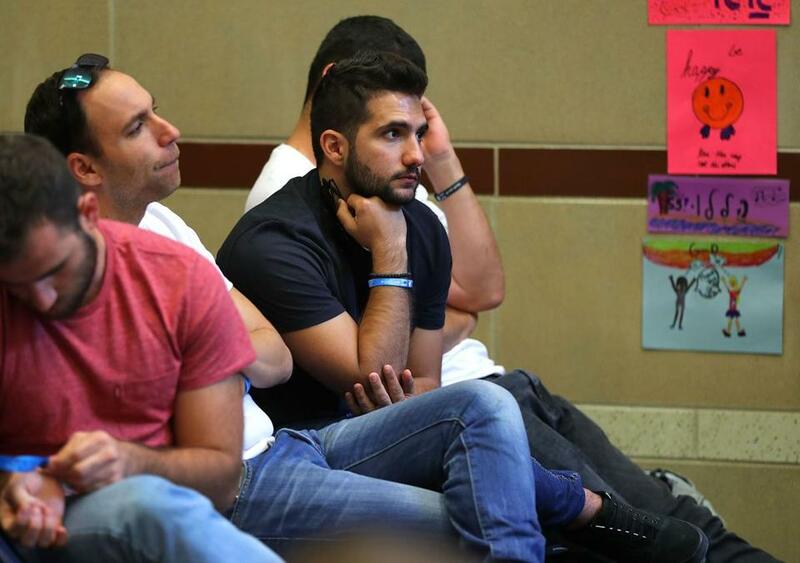 Former wounded Israeli soldier Ohad Poraz, 33, told his story at the Rashi School on Friday. Gil Benedek was trapped. The building he and fellow soldiers were trying to clear during a 2014 mission had been struck by enemy rockets, collapsing the roof. He saw two of his commanders in the Israeli Defense Forces killed, and a fellow soldier died in his arms. Benedek suffered severe injuries to his head, elbow, and shoulder. Afterward, Benedek shared his story only with his girlfriend. 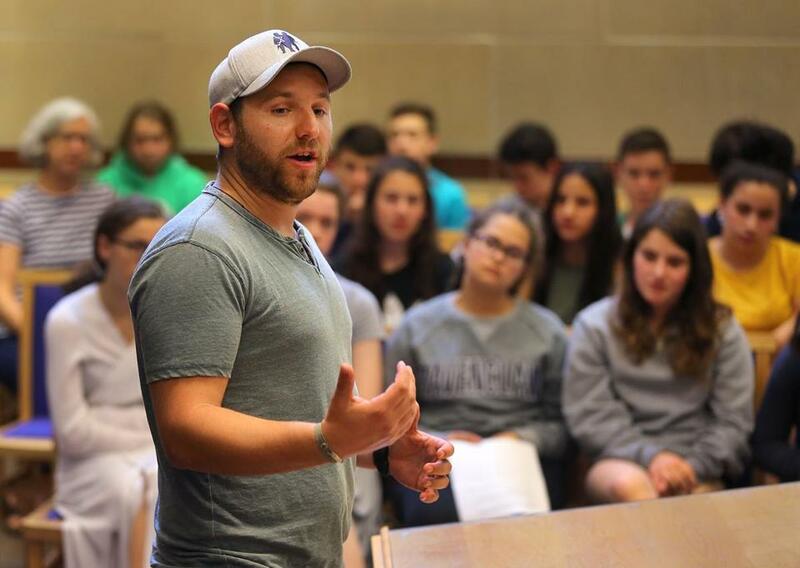 It took a trip to New York in 2017 with an organization called Brothers for Life, made up of injured Israeli combat veterans who help others scarred by war, for him to open up about his experience. Benedek and nine other wounded IDF veterans have been in the Boston area the past week with a Brothers for Life delegation, sharing their stories to help them along their path to healing. On Monday, the Brothers for Life delegation plans to meet with American soldiers who are part of the Wounded Warrior Project in Boston. Ohad Poraz, one of the delegation’s leaders along with Benedek, said that the apolitical group also builds strong bonds with American counterparts because they’re able to share their stories. They are the fourth delegation to come to Boston, according to Brothers for Life volunteer leader and chairman of the board for Combined Jewish Philanthropies Neil Wallack. The group has sent veterans to San Francisco, New York City, Miami, and Seattle, according to its CEO, Rabbi Chaim Levine. Brothers for Life currently has 830 members and is growing by 10 members a month, according to Levine. “It’s not just about veterans healing, we want them to reclaim their dreams and have new dreams. Our goal is to help them see that they can reach those,” he said. Another goal of the Israelis is forging connections with Greater Boston’s Jewish community, the fourth-largest in the country in 2015, according to Combined Jewish Philanthropies. On Friday, the delegation visited the New England Holocaust Memorial downtown with 93-year-old Auschwitz survivor Israel Arbeiter, and later talked about their experiences with students at the Rashi School in Dedham, an independent Jewish day school. Poraz answered with honesty and composure. He told the students how he was ambushed and that a bullet is still lodged in his right hip. He discussed how pessimistic he felt when he first joined Brothers for Life. He told the students about his nightmares and that he still sleeps with a night light because of his fear of the dark. Five families throughout Boston volunteered to host two soldiers each for the week. Wallack, who organizes the host families, said that there’s a waiting list to host the Israeli soldiers. The living arrangement makes them comfortable enough to share their stories with the families — often the first people to hear about the soldiers’ injuries. “In Israel, everybody is stressed and macho, you don’t want to share your story with other people who will judge you and say that you’re weak,” Benedek said. “When we come here the families won’t judge and will accept us as we are. This is the start of a process that will help us better be able to understand our own stories and share it in Israel,” he added. Former Israeli soldier Gil Benedek, 26, (black shirt) sat with Brothers For Life members at the Rashi School in Dedham. But the host families also show the veterans that there’s a greater community who cares about what is happening in their country. The veterans — eight Jews, one Druze, and one Bedouin on this trip — also build strong relationships with one another.